Upgrades include eBay Integration, Magento Extension, Warehouse Connector, Data Feeds and Pricing Tools. SALESWARP, a unique enterprise Storefront Management System that helps retailers increase sales while reducing E-commerce operating costs, announced the launch of SalesWarp 2.5 at the Internet Retailer Expo & Conference in Chicago on June 6, 2012. SalesWarp is exhibiting at booth #1612 located in the E-commerce section of the exhibitor floor. The release of SalesWarp™ 2.5 includes a redesigned user interface, an upgrade to the Magento store builder, expanded multi-store management capabilities (eBay and Amazon Connector), catalog and inventory management as well as advanced pricing tools. These additional capabilities combined with SalesWarp’s existing feature set gives retailers the ability to improve operations and quickly reach new customers. “SalesWarp™ 2.5 helps retailers improve sales with advanced product and storefront management while also improving operating costs”, says David Potts, CEO & Founder of SalesWarp. “We understand that merchants have their hands full managing their business; we help them focus on the key value added tasks by eliminating the technology pains and showing them new opportunities”. SalesWarp is gaining rapid adoption in the e-commerce market as a critical management tool for online retailers. 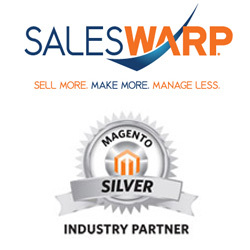 SalesWarp has recently partnered with technology companies like Magento and eBay, launched a reseller channel and created has created strategic partnerships with several key industry leaders. Saleswarp 2.5 adds many new features that help retailers of all sizes grow their business. SALESWARP, developed by 6th Street Commerce, is a web-based Storefront Management System specifically designed to help retailers build and manage their online stores more efficiently while increasing sales and reducing costs. Built on an open-source framework, SalesWarp helps maximize resources and drive ROI by connecting and managing existing systems (ERP, inventory, POS, CRM, shopping cart, shipping, financial) retailers are already using. SalesWarp was originally developed in 2009 to provide a better way to manage high order volumes and inventory from multiple warehouses. Today, SalesWarp provides retailers with automated tools for inventory management, product data, order management, fulfillment, pricing, SEO, shipping and customer data across multiple online stores from one system.